A friendly enough pub but one that had me feeling a bit edgy. Not a fan of pubs as day care centres, and there were a couple of children loose in the bar. With its slightly seedy appearance & some dodgy customers I was surprise to be charged 3.85 for a passable pint of Doom Bar, the most I paid in a pub in Manchester this visit. Couldn't get in the Port Street Beer House after visiting the Manchester Arena so came in here instead. A more prosaic range of ales - I had the Hobgoblin for £3.55 (on the good side of average) with Timothy Taylor Landlord, Robinsons Trooper and Deuchars IPA also on sale. Its the sort of pub where you have one in then move on. I didn't expect this part of town to be busy, but was a fair crowd in early on Saturday evening when I visited. There was a selection of real ale and I had the Dizzy Blonde which was served in a branded pint glass with the Dizzy Blonde logo. I'm easily pleased perhaps. Pleasant enough interior, as others have said not the traditional interior you might expect when looking at the place from the outside, but I don't think the pub is any worse for that - it is certainly not pretentious. The music was perhaps a little on the loud side considering it was only early - amusingly there is a sign behind the door reminding the staff to turn the volume up on Friday and Saturday nights, so we at least know the staff do as they are told! I'd be happy to call in here again but perhaps wouldn't make a special trip. 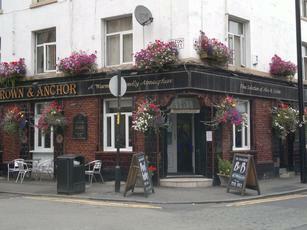 Very close to the Port Street Beer House which itself is well worth a visit. A handy pub somewhat hidden a little off the beaten track, but only a short walk from Piccadilly Station or Piccadilly Gardens. While not a traditional interior, it's a friendly pub. 4 cask ales available, some were decent although one was a bit warm, presumably stood in the line a while.